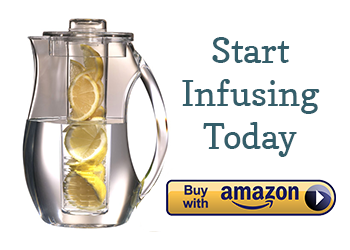 The best way to describe this infused water is “clean and bright.” The fruits add a touch of sweetness and you can taste the basil on the aftertaste. Plus, the combination of colors is quite beautiful! 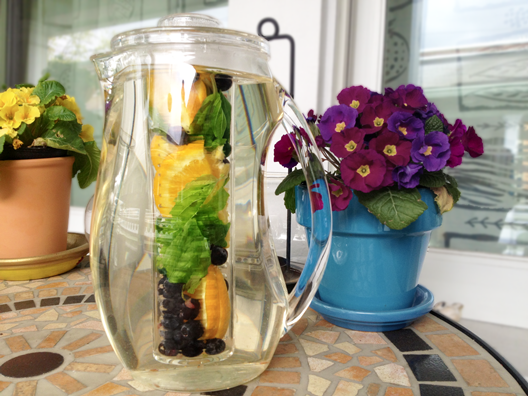 Recipe for an 80 oz Infused Water Acrylic Pitcher: 2 slices of organic orange, quartered, + 10-15 blueberries + 6 basil leaves. When you put in the blueberries, give them a small squeeze in your hand so that you break their skin a little. This will allow their juices to seep out. Also, when adding the basil, tear the leaves in half to allow the essential oils to be released. Enjoy! I am going to try this one tomorrow. Thank you for all of this information and helpful hints! I second what Tia said, I am very appreciative of your knowledge!!! How long should I infuse it for before serving? Thanks Amy!! I Imbout to make this one right now! Its so funny cause I have the same exact acrylic pitcher too! Its my first time infusing water and I wasnt sure if I just add the blueberries as is or I cut them..or what. You really helped me figure it out with ur perfect explanations and directions. Two questions firstly how long should it be left before drinking , secondly i hae a water bottle with a thing into put fruit and stuff to infuse that was given to me could I make this im that? How would you scale down the the ingridents? This is my favorite of all the recipes. Coming back to see how much to use to make a big pitcher! !